Hailing from Catalonia, salbitxada is similar to romesco sauce. There are many variants that involve roasting the ingredients, but this is a weekday version that’s tasty and quick to throw together. 1. Rub the steaks with 1 tbsp olive oil and the paprika; season. Toss the asparagus and peppers with the remaining 1⁄2 tbsp oil; season. 2. Heat a griddle pan over a high heat. Cook the steaks until cooked to your liking (about 2-3 minutes on each side for medium-rare, or a few minutes more for thicker steaks); rest under foil for 5 minutes. Griddle the asparagus for 1-2 minutes on each side, until tender and charred; set aside. Griddle the peppers until just warmed through. 3. Meanwhile, mix all the ingredients for the salbitxada sauce in a small bowl and season. 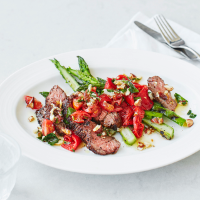 Slice the steaks and serve with the peppers and asparagus, plus the sauce to pass around.